I love funky-looking things. Especially vegetables. Remember my experiment with growing kohlrabi? Romanesco is a a funky-looking thing. And when I had a choice between broccoli and romanesco, I jumped on it. It’s a bit like broccoli, taste-wise. Look-wise, though, it would be what Escher would paint/draw if he took the vegetable route with his art. 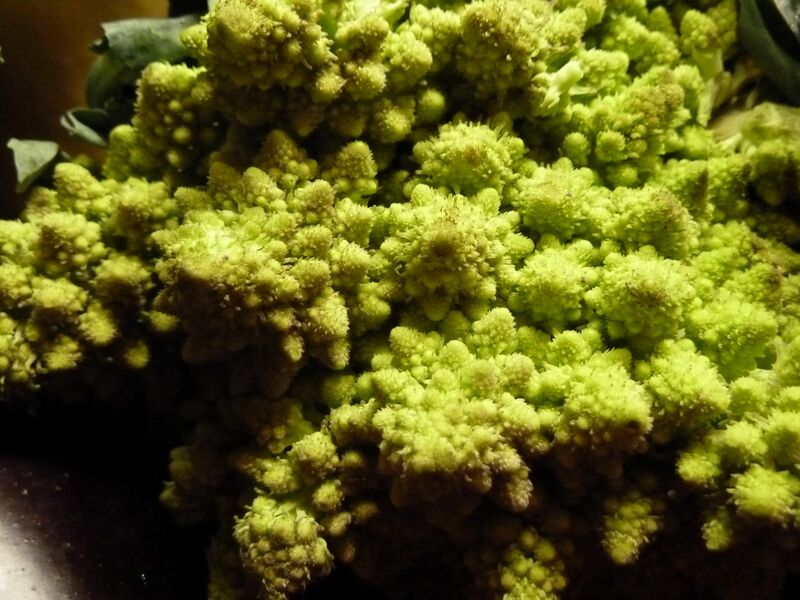 Now, the thing about romanesco is that a good portion of it is stem. If you cut off the stem portion and leave just the florets, you’ll be left with not so much. Eat the stem, people. It’s tasty. What to do with romanesco? Well, when I see the Brassica genus, I think roasting. And that’s exactly what I did. 1 head romanesco, separated into individual stem-florets or clumps of smaller florets. -If any of your romanesco sections look particularly large, feel free to cut them in half. Place romanesco sections in a big bowl. Douse with the olive oil. Sprinkle two or three large pinches of kosher salt on top (depending on the romanesco’s size) and give it a couple turns from a pepper grinder. Toss. -Spread romanesco onto a rimmed baking sheet and pop in the oven for about 23-25 minutes or until they develop a nice brown char and a fork can just be inserted. Finally, a new item to share space with broccoli and cauliflower in the winter months. You are currently browsing the broccoli category at The Dainty Dot.